Bummer. I don't own any of their EPs but our of what they have for sale now, is anything ​in their selection a must have, or just meh? 38mm 70AFOV Koenig? Don't have it, but I have the 40mm 70 AFOV Koeing and it is one of my favorite eyepieces for widest TFOV. I got good service out of my 40mm MK70 from UO but it went up for sale the instant it got compared to the XW40. If you have a primo refractor this is NOT the wide field to get. And frankly, it fared quite poorly in comparison to the XW40 in the C14 too. I did buy stuff from UO but I suspect their orthos were the OCULARS that did the best job of competing against today's high end alternatives, many of which were only made and sold in limited sets. I would add that there's nothing wrong with a mid-priced wide field. The UO40 was a huge step up from the Rini it replaced. But what the XW40 showed me was that there is an ocular that is as far above the UO 40 MK70 as the MK70 is above the Rini. I really thought the UO 40 MK70 was the end-point wide field eyepiece for me and used it for, I dunno, maybe five or six years. I was astounded at how much more I liked the Pentax. Edited by gnowellsct, 09 June 2017 - 04:06 PM. I got a flyer in the mail today saying that they are closing down the business after 55 years! In 1976 when I bought my first telescope I purchased 5 or 6 eyepieces from University Optics. Over the years I've and bought a few more. 3 years ago I bought 4 Orthos from them. Shame to see them shutting down but after 55 years the owner deserves a good retirement. Mods if this isn't the right place for this feel free to move it. My father and I built my first telescope around a Coulter 8" f/7 mirror about 1970. The ancient nearly stereotyped owner of Op-Tech in Eastern Los Angeles County spoke highly of University Optics and I have never been disappointed with their volcano-top orthoscopics. I now have the 4, 5, 6, 7, 9, 12.5, 18, and 25mm ones. It would be good if someone bought them out. Where in town was the store located and how long ago did it close. Pretty sure it has been just a mail order place since I got into the hobby. I never knew the people who ran UO personally. Do I understand that this was a mom-and-pop operation (a married couple)? "Father and son" if I recall, actually. it's true, the 7/70 Konig that I loved for years lost out quickly to a 35mm Panoptic and later, XW's. The UO 2-inch prism diagonal was replaced in similar fashion when I bought an AP Maxbright. But those two items were the premier wide-field diagonal and ocular for years before that. You could say the 2-inch Konigs were originators of all the modern 2-inch widefields of today. As I recall, when they came out, the only options were surplus Erfles or 2-inch Erfles from Edmund or Brandon. I think it was the first mass-produced 6-7 element widefield that tried to improve on Erfles. It replaced 55mm Plossls for people with f/8 scopes, with the new multicoatings the "majesty factor" became possible. My 16mm Konig was also in heavy use until I replaced it with a 16.8mm Docter wide-field ocular. Edited by Scott99, 10 June 2017 - 10:13 AM. I note that Gary Hand also retired, he was liquidating inventory at NEAF. Gary was liquidating inventory back in the 80s. Ah well, another generation passes. I was at NEAF very late on Sunday with a friend who wanted an inexpensive 1.25" Barlow for planet imaging. We ran into Gary and he said "I may be able to help you if I still own my stuff. I'm working on selling it all to another dealer." He did help us, but another dealer was there buying everything Gary had left on the floor ( a lot of stuff ), but they had not concluded the deal. However, the people running the Cherry Springs Star Party later this month list Gary as an assured vendor. However, he usually brings more "swap meet" stuff to CSSP rather than new stuff, and he tends to be there more as "an astronomer" versus "a vendor". As for University - late last year I purchased one of their 32mm X-hair eyepieces. My friends liked it so much that at least 3, maybe 4 purchased on based on seeing mine. About 18 years ago I got one of their 8x50 RACI finderscopes. Still using it today onn my 10" newt. I love it, it produces nice sharp stars. At the time, I recall there weren't that many correct image right angle finders around. The website is now gone. Loved their Orthos especially! I sure wish I had known they were closing - totally missed the news. I would have loved to pick up a few items before they closed. Rats! I received a close-out list of eyepieces and accessories from UO a couple weeks ago in the mail. I looked through their listing, and circled a few eyepieces I might buy. Then I thought again and decided against it. I had a number of UO eyepieces over the years. The orthos especially were decent. If I had gotten a similar sales list just a few years ago, I probably would have gone for it. But now it just doesn't make sense for me. You can't go home again. Edited by Sarkikos, 29 August 2017 - 12:11 PM. I still have an 18 and a 12.5 mm UO ortho eyepieces to use with my solar scope, but sold the rest of the set over the last few years. Probably should have kept the 25mm. Does that mean that my full set of UO VT Orthos, with latest coatings but without the hated barrel undercuts, will be appreciating now? The volcano tops should sell for at least $500 each. Who wants flat Zeisses, when you can get one of these? It's another reason I like the BCOs; they are quasi-volcano tops. Edited by Peter Besenbruch, 29 August 2017 - 02:58 PM. Get thee back with that clonal garbage! Those BCOs were made with giant conveyor belted machines and child labor in a third world sweat shop! Quasi-VTs indeed! What an outrage. They were not lovingly crafted, one at a time, by the delightful Mr. Tani, as he contemplated nature and the purpose of being, sipping green tea, while he assembled them. Why, in fact, I am pretty sure Mr. Tani left a bit of biological material in the cement between elements in my 9mm. That has to make it worth over $1000. I mean 1000 years from now they will be able to clone Mr. Tani from that speck, and introduce the joys of lovingly hand crafted, only partially multi-coated, narrow FOV eyepieces to a new generation of cyborgs. The more I think about it, these aren't going for anything less than $800 each. I mentioned the lack of undercuts, didn't I? They weren't even "partially multi-coated" when I owned some. Also, another comment about the BCOs: They are wide field, non-ortho, orthos. I have trouble getting used to the endless, pincushioned, vistas offered when switching to them from my Takahashi(e?)s. The MK70 Koenig 40mm is still my second most used eyepiece. For years it has been my wide-field choice in the C11. Just last week at our 3/4 total eclipse party (we're not in the totality zone) it went in the Edge 800HD for the best view of the sun. 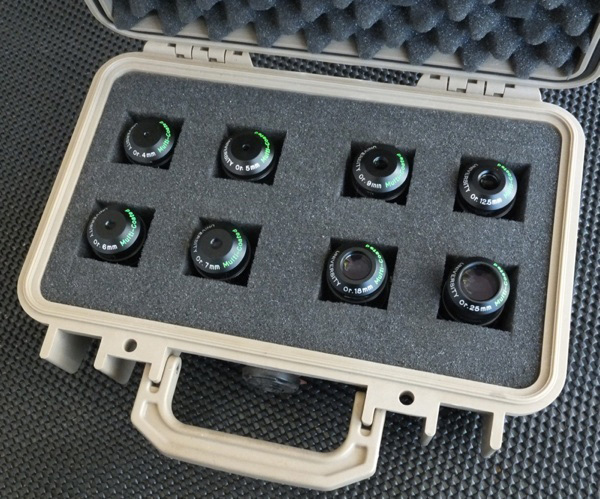 I have an eyepiece case full of Tele-Vues. I originally planned on using the UO 40mm until I could get around to getting a 35 or 42 mm Panoptic, but I really never felt the need. Now I don't see me ever getting rid of the Koenig. Glad I got the 18mm last year. I bought my first set of orthos eyepieces from UO when I was 14 in 1975. I went in person. Zeeb Road was in the country then. It's all developed now. I bought my set of Claves a few years later. Sold them off as they where duplicates. Last year I picked a 25 mm Ortho last year. Looking pickup a 12 and six. I noticed that the Kohi Orthos went up in price. Well, we still have the Brandons. Edited by Mordakyblu, 02 September 2017 - 08:45 PM. I confess. These are sentimental favorites. They have never disappointed me. These have the safety cuts but are used in Baader click-lock clamps so that's a moot point for me. Did Jim mention that his have no cuts? Many thanks to UO for decades of service to the amateur astronomy community. 1975 was about the time I became aware of University Optics, and ordered eyepieces, and a large hunk of Sonotube from them. Yes, I see Japanese orthos going for $100, including shipping and a screw case today. The Baader Classics are $13 cheaper, and easily their match. The Takahashi orthos are wonderful, but at $153-206 plus shipping, THEY aren't cheap. I own two Baaders and two Takahashi(e?)s. When it came time to try an 18mm, I went with the Baader. They really are that good. My experience with the recent Fujiyama (KK) orthos is limited to the 7mm. They never bothered to blacken the edge of the eye lens, and contrast suffered as a result. A $30 Plössl would outperform it. So now I have a jumble of orthos: Baader, Takahashi, and an old Meade. I was one of those people who decided to get rid of his orthos for the "new," "modern" (Super-)Plössls of the 1980s. That isn't going to happen again. The only orthos I have now are a 6 BCO, 10 BCO, 12.5 Hutech HC and a 0.965" CZJ Orthoskop-Ocular 12.5x (20mm) microscope eyepiece. I keep the BCO's and Hutech for possible deep sky use, since the rumor is they have good light transmission. I don't use them for planet/lunar. I keep the CZJ because it's a CZJ. I view planet/lunar mostly with my XO's, sometimes with the Nagler 3-6 Zoom. I use the Ethos if want a nice long view before nudging. I think I'm about done with orthos. Edited by Sarkikos, 03 September 2017 - 10:57 AM. I bought my first telescope from them back in the 1975. An 8" F7 Newtonian OTA with a few UO eyepieces, 20mm Kellner, 8mm Konig. It still puts up great views today. Went there personally to pick it up in Ann Arbor. I view planet/lunar mostly with my XO's, sometimes with the Nagler 3-8 Zoom. I use the Ethos if want a nice long view before nudging. It's not the first time you've wished for a Nagler 3-8 zoom. Hope uncle Al is listening. You're right! Is that a Freudian slip, or a wish fulfillment daydream? In any case, yes I want a Nagler 3-8 Zoom! It would match up perfectly with my Baader 8-24 Zoom. Edited by Sarkikos, 03 September 2017 - 11:00 AM.